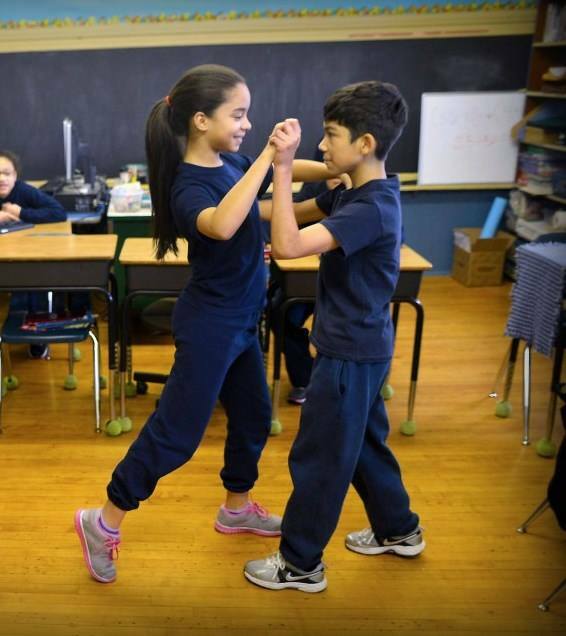 Dancing Classrooms Philly doesn’t have to end after the ten week in-school residency. All DCP residency graduates are invited to participate in our DCP Academy, which takes place on Saturday mornings during the school year. Classes are held at convenient and accessible locations in Philadelphia, including St. Christopher’s School in Northeast Philadelphia, CHI Movement Arts Center in South Phildelphia, and the University City Arts League in West Philadelphia. DCP Academy Participants receive more advanced instruction in the dance from the fifth grade syllabus, along with an introduction to new dance from different cultures. These lessons nurture confidence, motivation, discipline, and performance quality. More importantly, Academy continuing education classes provide children with an opportunity to meet peers from other schools and develop lifelong friendships. They also provide exposure to the civility, social manners, and elegance expected in adult life. For more information, email info@dancingclassroomsphilly.org. Be sure to regularly visit our Events page for upcoming DCP Academy In-Studio Performances! To enroll your child in the DCP Academy, please click here! To pay for Academy classes online, use the button below!